Before the introduction of Morning Glory, Asparagus Fern and Lantana, our bushland had and has many species of native vines that produce cascades of beautiful flowers during the Spring and in some cases, all year round. This week we’d like to share a few alternatives for those who like bright flower massed bowers that will bring in the resident birds and non-stinging native bees. 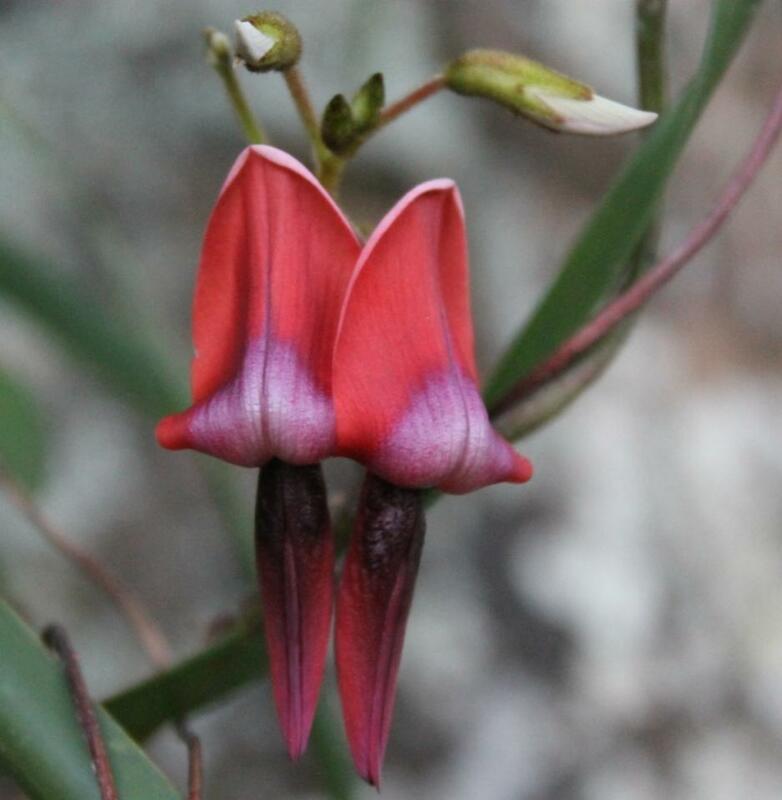 Kennedia rubicunda (Dusky Coral Pea) is a species of flowering plant in the family Fabaceae, endemic to Australia. It occurs in the states of Victoria and New South Wales and Queensland. It is a vigorous climber which stems up to 4 metres in length and has oval-shaped leaflets in threes that are about 3 to 12 cm long. Dark red pea flowers are produced in racemes from late winter to spring and are followed by pods. The species was first published in 1795 under the later rejected name of Glycine rubicunda (Dingy-flowered Glycine) by in Curtis's Botanical Magazine. In 1804 it was published under its current name by E.P. Ventenant in Jardin de la Malmaison. This plant is noted for its vigour and can be used to cover embankments or structures. The species is adapted to a range of well-drained soils and adapts to positions with sun or partial shade. It is resistant to drought and has some frost tolerance. The species can be propagated by scarified seed or cuttings of semi-mature growth. Dusky Coral Pea, photographed Barrenjoey Headland August 2013 by A J Guesdon. 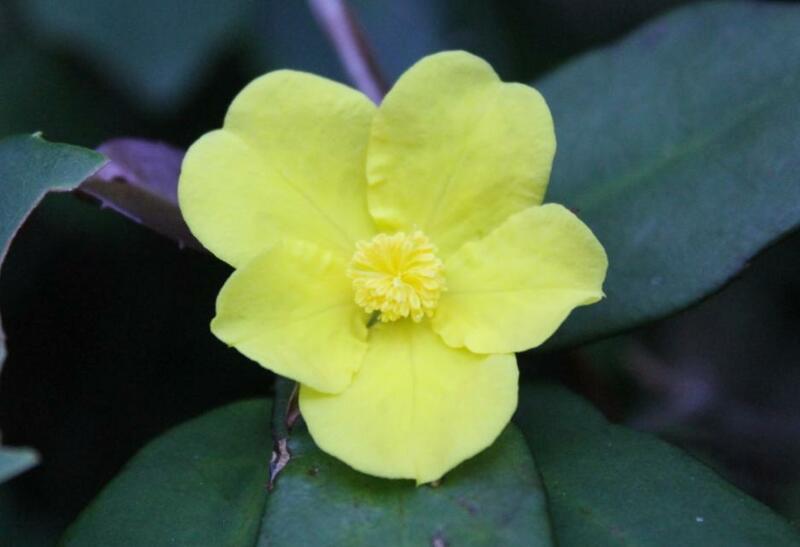 Hibbertia, or Guinea flower, is a genus of trees, shrubs, trailing shrubs and climbers of the family Dilleniaceae. Around 150 species occur in Australia of which two are also found in New Guinea. They are generally small to medium shrubs with yellow, buttercup-like flowers. Additionally, 24 species occur in New Caledonia, one of which is also found in Fiji, and one other species is endemic to Madagascar. The genus is currently being revised by Helmut Toelken of the South Australian Herbarium. The genus takes its name from George Hibbert (1757 - 1837), an eminent English merchant and amateur botanist. 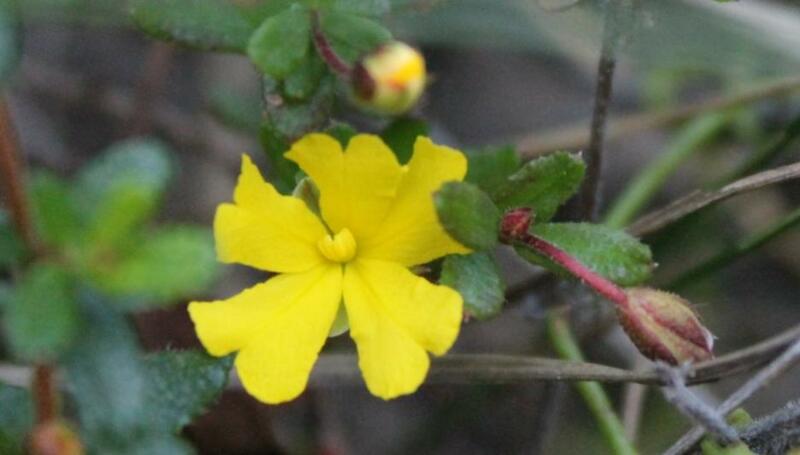 Hibbertia - Both kinds shown here photographed Barrenjoey Headland August 2013 by A J Guesdon. Wonga vine, Pandorea pandorana, has leaves with three to seven leaflets. Young plants have rather ferny looking leaves with numerous small, almost circular leaflets with toothed edges. 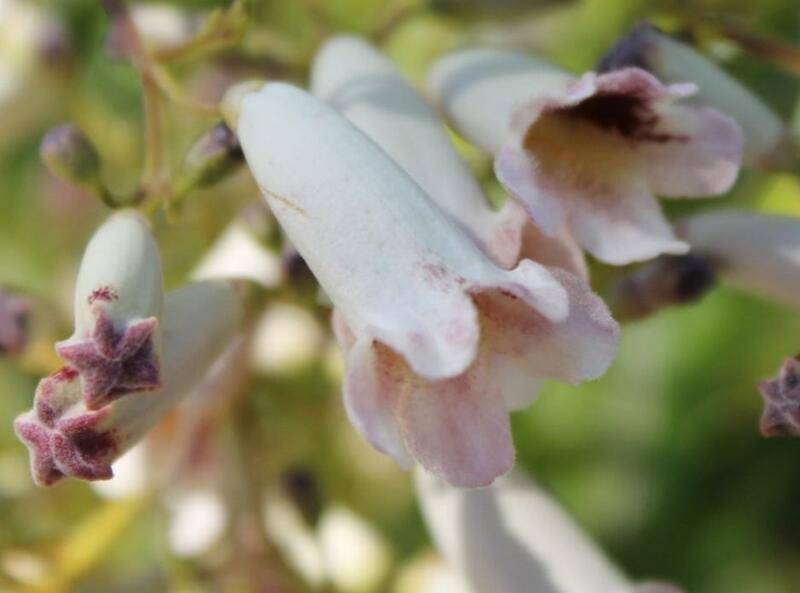 Flowers are tubular, cream, with brown or purple speckles in the throat, in large hanging clusters, borne in spring. In drier bush wonga vine is often only a small plant, but in rainforest it can become massive, with trunks to 20cm or so thick which loop through the trees. The rest of the plant can be hard to see though, as the leaves are all up in the tree canopy. andorea pandorana, commonly known as the Wonga Wonga Vine, is a species of woody climbing vine in the family Bignoniaceae. It is found in Australia, Malesia and the southwestern Pacific region. It forms large pointed pods filled with papery seeds. It is easy to germinate, having two-lobed dicotyledons. It is a popular garden plant, common cultivars include the yellow-flowered P. 'Golden Showers', the white-flowered P. 'Snowbells', and the pinkish P. 'Ruby Belle'. The wood was used as in making spears for woomeras in the Central and Western deserts. Due to its cultural significance, a group of mythological women with slender and flexible bodies were named after it. The species was first described by English botanist Henry Charles Andrews in 1800 as Bignonia pandorana, before being given its current binomial name in 1928 by Steenis. Both the generic and specific name are derived fromGreek mythological figure Pandora. The Scottish botanist Robert Brown had described it as Tecoma australis but this name was ruled invalid. A form found in dryer inland regions was previously known as P. doratoxylon. Pandorea pandorana ranges in habit from a scrambling plant to a vigorous vine, growing on larger trees in forested habitats. It has glossy green leaves arranged oppositely along the stem. The pinnate leaves are around 8–16 cm (3–6.5 in) long and have 3–9 leaflets of varying widths. The juvenile leaves are finer and have serrated margins, and more finely divided into 7–13 leaflets. Flowering occurs in spring. A highly variable species, it is found across continental Australia in every state. It is also found in Indonesia,Papua New Guinea, the Solomon Islands, New Caledonia and Vanuatu. It is also found on Flinders Island inBass Strait, but not on mainland Tasmania. In New Zealand the species has become naturalised within disturbed native vegetation near parks and gardens in which it is cultivated. Pandorea pandorana was first raised in England in 1793 by Lee and Kennedy at their nursery in Hammersmith and had flowered in cultivation by 1805. Material was also sent to the garden of the Château de Malmaison under the auspices of Joséphine de Beauharnais. Cleland JB, Tindale NB (1959). "The native names and uses of plants at Haasts Bluff, Central Australia". Transactions of the Royal Society of South Australia82: 123–40. Wonga Vine, photographed Barrenjoey Headland August 2013 by A J Guesdon. Hardenbergia violacea syn. H. monophylla is a species of flowering plant in the pea family Fabaceae, native to Australia from Queensland to Tasmania. 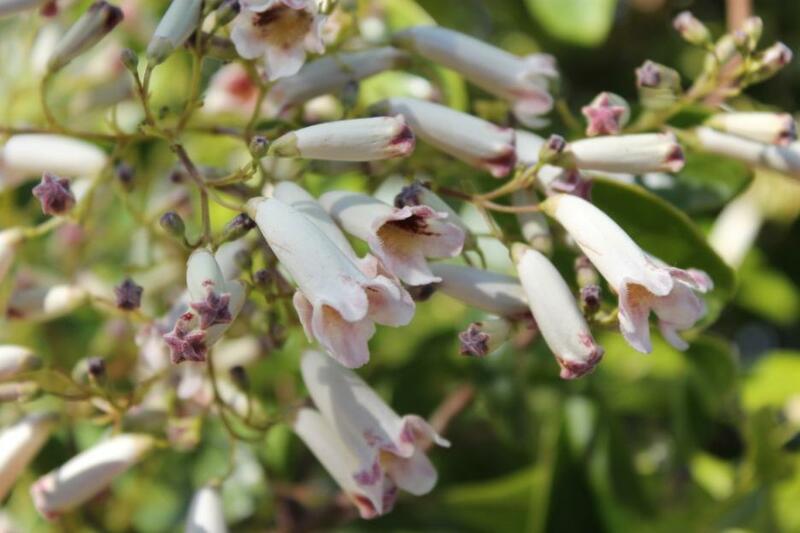 It is known in Australia by the common names false sarsaparilla,purple coral pea, happy wanderer, native lilac and waraburra (which comes from the Kattang language). Elsewhere it is also called vine lilac or lilac vine. It is a vigorous evergreen climber growing to 6 m (20 ft) or more, sometimes growing as a subshrub. It has typical pea-like flowers which are usually violet but can be white, pink or other colours. The leaves are dark green, "hard" and leathery, with prominent venation. H. violacea is a widespread species found in many habitats. It is also widely grown as a hardy garden plant, with many cultivars now available. In the UK it has gained the Royal Horticultural Society'sAward of Garden Merit. 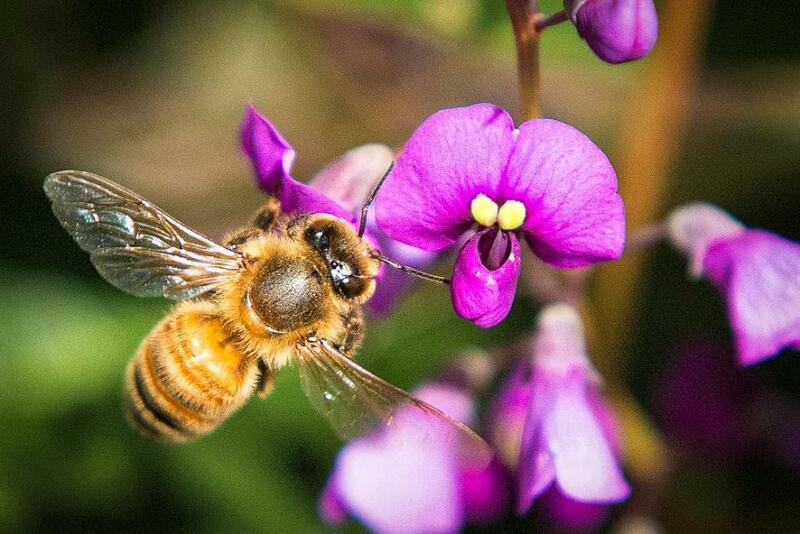 Hardenbergia violacea , and European honey bee Apis mellifera by Michael Mannigton, photographed in Bilgola Park, August 2013.